I’m not generally a fan of tart things, but these gorgeous little ruby-red berries are a favorite. I always start keeping my eyes peeled for them once October arrives, and it never fails that when I finally see the cranberries for the first time a few bags make their way into my cart. Then it’s home to begin searching for recipe ideas – sweet treats mainly, as the savory recipes are almost always too tart for my tastes. I’d bookmarked these streusel-topped shortbread bars a while ago, but I’m so glad I didn’t actually make them immediately. Then I wouldn’t have benefited from the wisdom of my TWD buddy Valerie, who adapted this recipe ever so slightly, but in the best way possible. Rather than just melt the butter for the crust and streusel she browned it! A simple change that makes ALL the difference, because browned butter just makes everything it touches that much better. The simplicity of this recipe can’t be beat, even adding in the extra step of browning the butter. The same dough is used for the crust and streusel topping, while the filling is as easy as cooking down some cranberries with water and sugar (and flavoring if you wish, I added orange zest). Once baked, the crust is rich and buttery, and of course slightly nutty since you browned the butter. The streusel is a touch sweeter than the crust, working nicely to balance the tartness of the cranberry filling. Some of the reviewers of the recipe noted that they cut the sugar in the filling by 1/4 cup, but I wouldn’t change a thing. I do wish the streusel had baked up slightly more golden brown, though I’m just being nit-picky now. My next cranberry project? I really want to try sugared cranberries. Anyone have a recipe/method to recommend? To make the crust: Line a 13×9-inch metal baking pan with foil, leaving an overhang on opposing sides so you can lift the bars out after baking. Spray the pan and foil with nonstick cooking spray. Add the butter to a medium saucepan set over medium-low heat. Melt the butter, swirling the pan frequently. Once the butter has melted, it will start to bubble and foam. Continue to cook (continuing to swirl the pan) until the butter turns brown and smells nutty – be patient and watch carefully, it can go from brown to burned quickly. Turn off the heat under the pan, and let the butter cool until lukewarm. In a medium bowl, whisk together the butter, 3/4 cup of the sugar, and the salt. Beat in the egg yolks. Use a rubber spatula to stir in the flour until completely incorporated. The dough will be thick and stiff. Transfer about 2 cups to the prepared pan and press into an even layer in the bottom of the pan. Prick the dough all over with a fork, then chill in the refrigerator for at least 30 minutes, or until firm. Meanwhile, preheat oven to 325 F.
Bake the crust for about 20 minutes, or until it begins to set, but has not yet started to brown around the edges. While the crust bakes, make the streusel by combining the remaining 1/4 cup of sugar with the reserved dough. Use your fingers to mix until crumbly. Also use this time to make the cranberry filling. Combine the cranberries, sugar, orange zest and water in a medium saucepan, and bring to a boil over high heat. Reduce the heat to medium-high, and continue boiling until the mixture is thick and syrupy (most of the cranberries will have popped), about 5-8 minutes. Turn off the heat, and let cool for 5-10 minutes. Spread the cranberry mixture in an even layer over the hot crust. Sprinkle the streusel over the top. Increase the oven temperature to 350 F, and bake on a rack placed in the top of the oven for about 25 minutes, or until the streusel is golden. Transfer the pan to a wire rack and cool for at least 1 hour (you can also cool in the fridge if you want to speed up the process). Once cool, use the foil handles to lift the bars out. Place on a cutting board, and cut into squares before serving. Store for up to a week in an airtight container at room temperature. 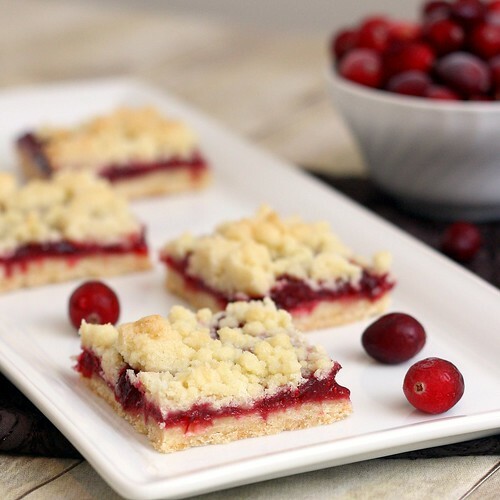 18 Responses to "Brown Butter Cranberry Streusel Shortbread Bars"
I love cranberries and will try these this year! I have used this recipe for Sparkling Cranberries for years from 101 Cookbooks, they are incredible – and taste great in champagne! 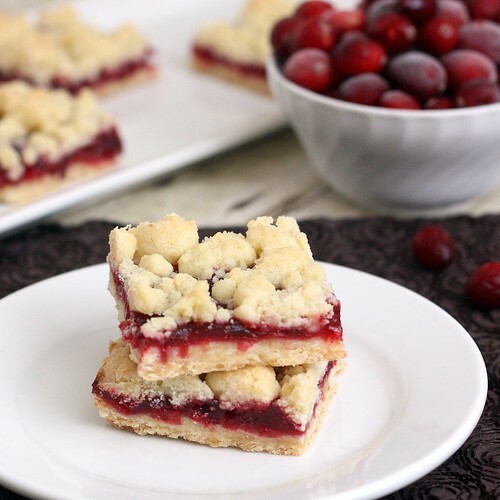 Cranberry is possibly one of my favorite winter flavors for desserts. Yum! 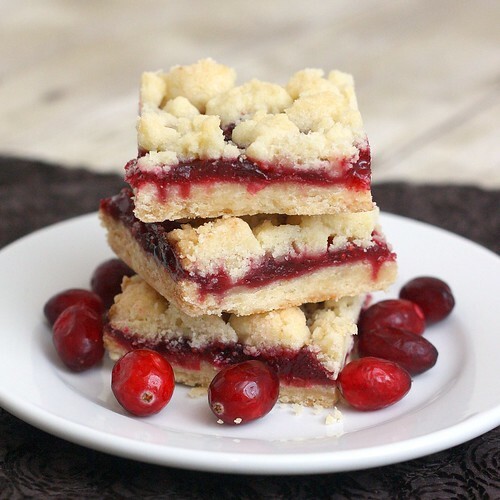 I love streusel bars. I’ve never used fresh cranberries in a recipe before, only their dried, sweeter cousins. This looks like it’d be good to balance out the tartness, though! I love baking with brown butter.. It adds a lovely nutty flavor to everything. So well paired with sweet and tart cranberries! How did I miss this one? I guess the holidays are getting me behind! Anyway…loved these. Just the right amount of tart and sweet for me. I was a huge fan. They are now all gone. Thanks again for sharing. These sound great. I have cranberries in my freezer and should really make something with them. Can’t wait to see your sugared cranberries – they are so pretty, but I don’t know how they’re made. These are gorgeous! And, I just happen to have some cranberries hanging out in my freezer. Can’t wait to give this one a try! They are in the oven right now as I type! I am taking them to a church Christmas party and cannot wait to see how they taste! They smell amazing..
I’ve warmed up to cranberry over the last couple of years. This looks like a great holiday treat. Great idea to brown the butter! I have cranberries in my freezer from last year (or was it the year before?) that I keep forgetting about. These bars sound like a great way to use some of them. The best and the crust and cranberries are delicious. We really love this recipe and we plan to make it a part of our holiday tradition. I made these yesterday for Christmas dinner and they came out fantastic! I will definitely make them again! !